Indonesian President Joko Widodo will visit South Korea next week for a summit with President Moon Jae-in, which will focus on ways to enhance the countries’ bilateral cooperation, Moon’s presidential office Cheong Wa Dae said Monday. The Indonesian leader will make a three-day state visit from Sunday. 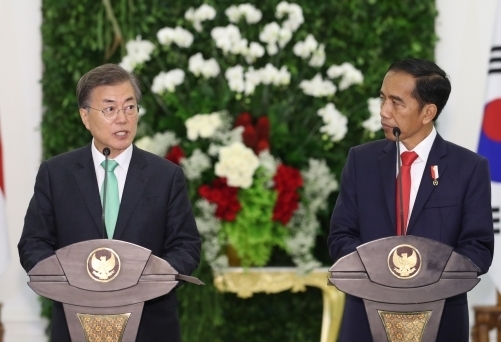 The leaders will hold their summit meeting the next day, when Moon will also host a state dinner for his visiting Indonesian counterpart, according to Cheong Wa Dae. “At the upcoming summit, the two leaders are expected to discuss specific ways to strengthen the countries’ special strategic partnership,” it said in a press release. Widodo’s trip will reciprocate Moon’s state visit to the Southeast Asian nation last year, during which the leaders upgraded their countries’ ties to a special strategic partnership. It was in Jakarta that Moon unveiled his so-called New Southern Policy, which seeks to greatly improve South Korea’s diplomatic and economic relations with India and all 10 member countries of the Association of Southeast Asian Nations, including Indonesia. “(Widodo’s) visit will make Indonesia the first ASEAN nation to have exchanged visits by their leaders with South Korea since President Moon took office,” Cheong Wa Dae said.